It was a while in the making. 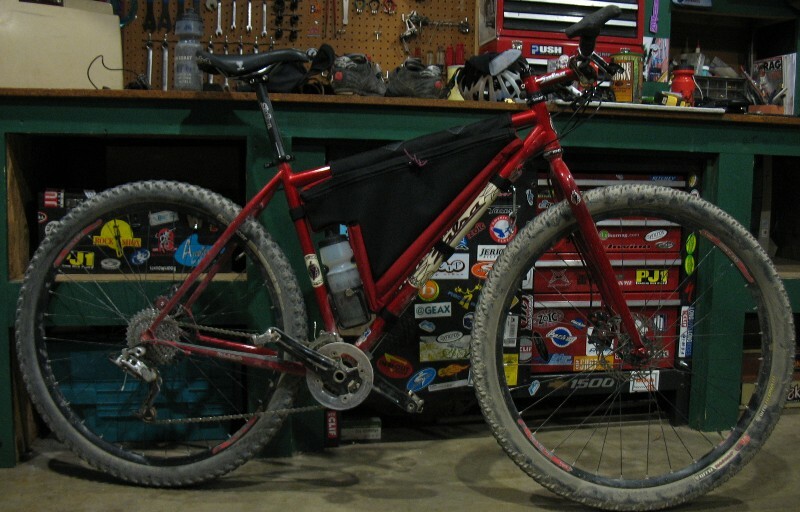 I needed a large frame bag for multiday trips in an effort to get the load off my back. This cost about 15 bucks and around 11 hours total time. So, at the rate most people get paid, it was about 235 bucks. The satisfaction of making it yourself is hard to beat though. I will let you know how it works out shortly. That looks like some beautiful work you did. I thought I was doing well by slightly revamping a JanD frame bag to fit on my bike. 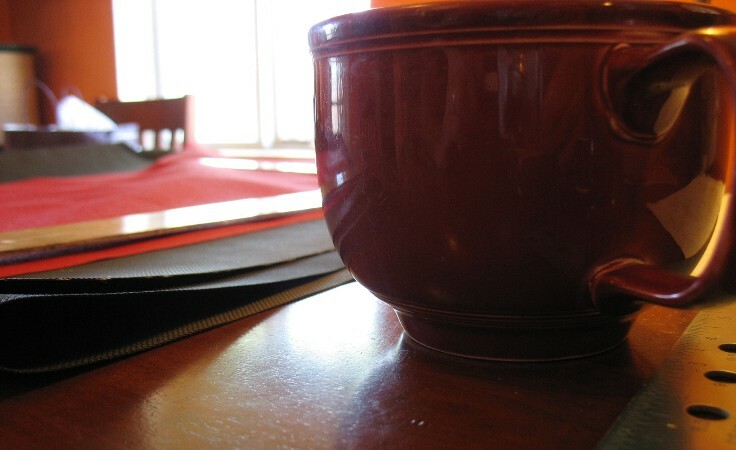 You can’t really look at the hourly cost, because like you say, the satisfaction that comes with it is priceless. So, are you tackling a seat bag next? yes. 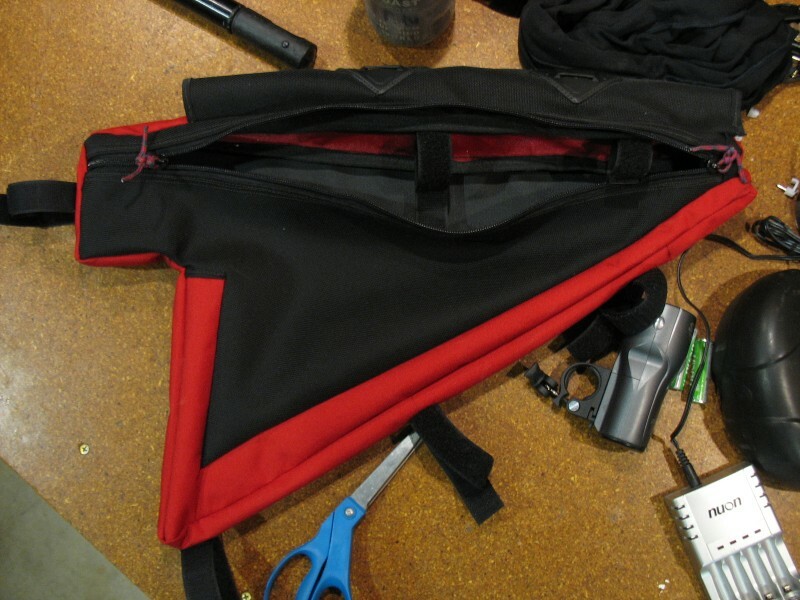 the seat bag is on the drawing board. I will let you know how it goes. awesome – I assumed these were widely available in stores, and after looking for one the other day, had no such luck. may take your route and make one up. could also add internal front pouches for light batteries. Wow, you obviously have some sewing experience. Very nice looking bag and nice setup as well. 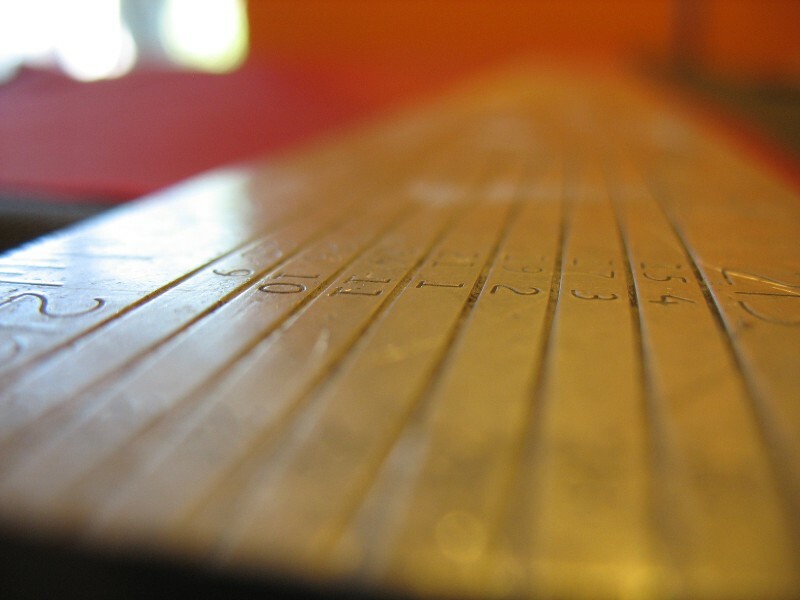 nice work – like the macro photos. what do you have planned for the top plastic pieces? Water repellant? Do soft sided models retain water weight? Half gallon milk jugs welded together would truly repel water. And be a good width. Do soft sided bags get heavy when wet? My typical seatbag gains weight wet. 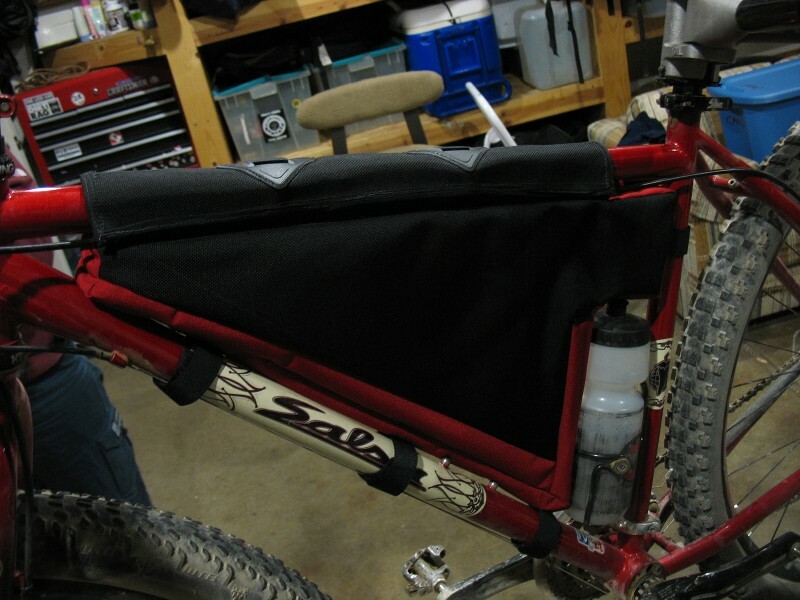 Been trying to invent a milk “gallon jug” seatbag, hard to fit everything through that little hole tho. I have thought about slight supports to the “gallon jug” from the seatstays. The material is 1050 Cordura, coated with a water repellent. I have had it soaked and it did not take on much weight. Anything carried in it would not care if it got wet anyways. Gordo, your post inspires me! My co-workers wife has an old Singer 300W she is tempted to part with. I have been contemplating buying it and make my own bags. I know there will be a learning curve but like you said, the satisfaction of making something yourself IS priceless and it allows you to make all the decisions. I think im going to pull the trigger! 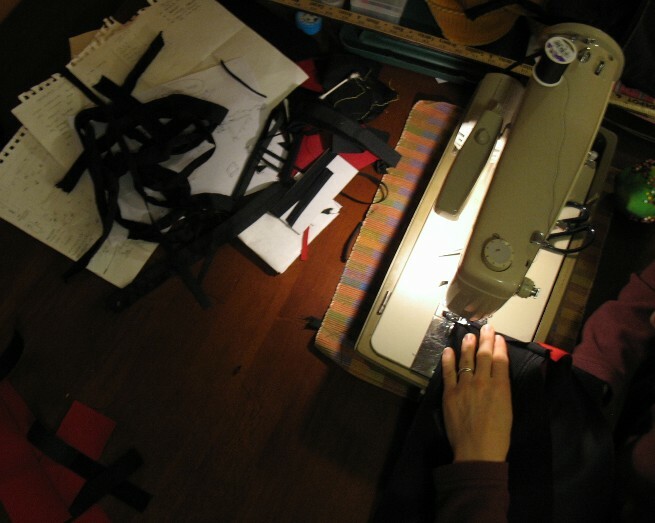 Where is a good place to buy fabric, zippers, etc ??? …just make sure to get enough so that its okay if your first attempt is not useable. 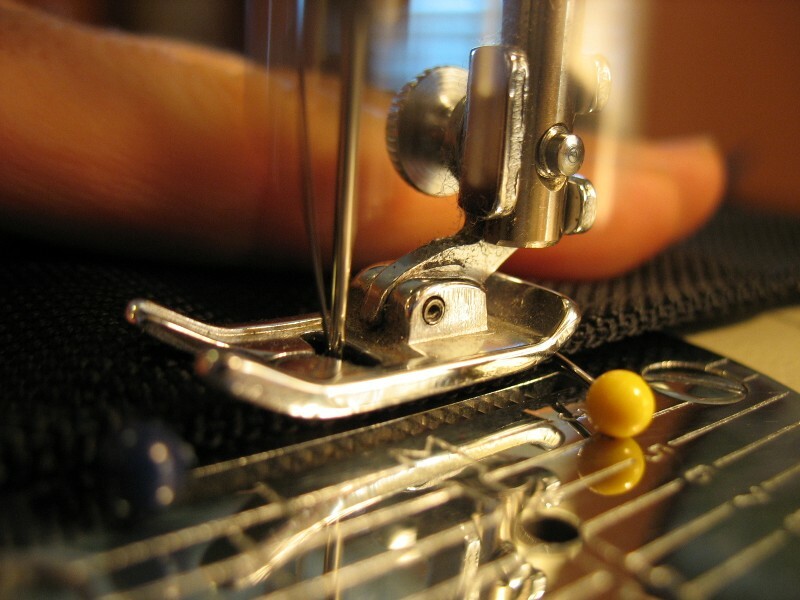 seattle fabrics is a good source – that is where we ordered our materials from. If this pack is to be used for long, unsupported treks, think I would have made the pack fit the entire triangle and omitted the water bottle cut-out, instead sewing-in a compartment to hold a large volume water bladder. I like the design for commuting and other short trips as I wouldn’t need a lot of storage for water but for “stuff”. 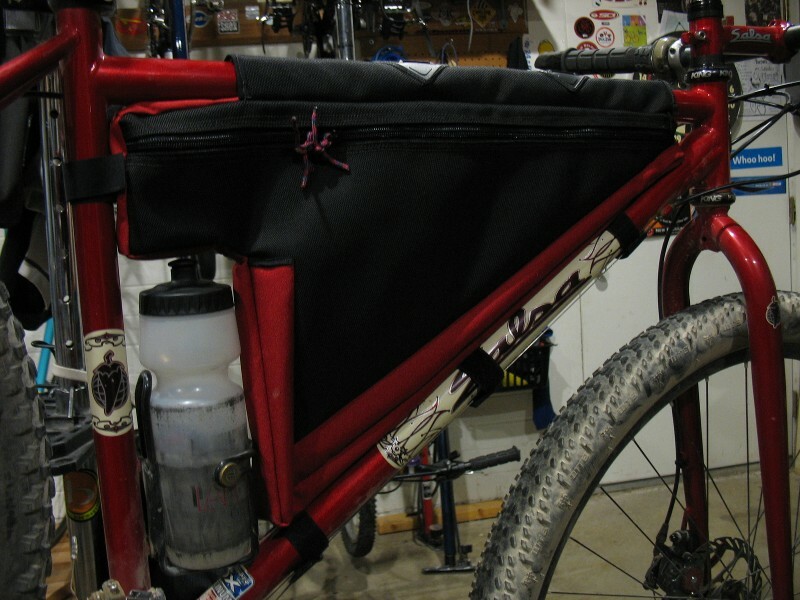 I have a similar bag that is smaller, fits in the top half of the frame triangle and it has always proved very useful, but its generic design didn’t fit all my frames equally. Did you make the water bottle cut-out for fear of the pack bulging and interfering with cranks? I think it’s great and will look at making my own to fit my FS bike. Great work. I just ordered some spectra gridstop and fixings to make a full frame bag for my 1×9 Jabberwocky. 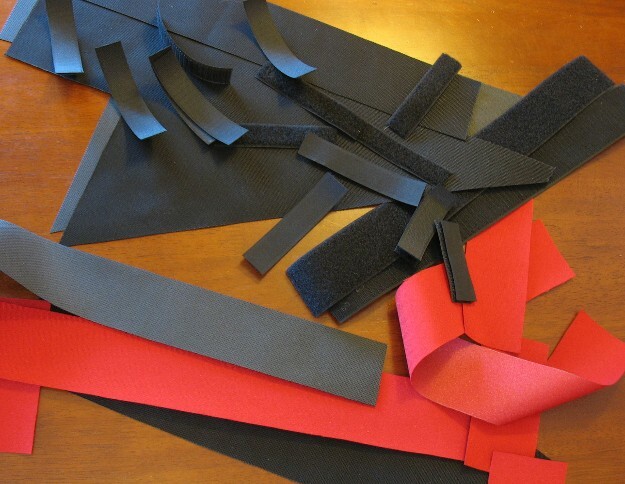 Did you use anything to stiffen the edges, or just wide velcro? 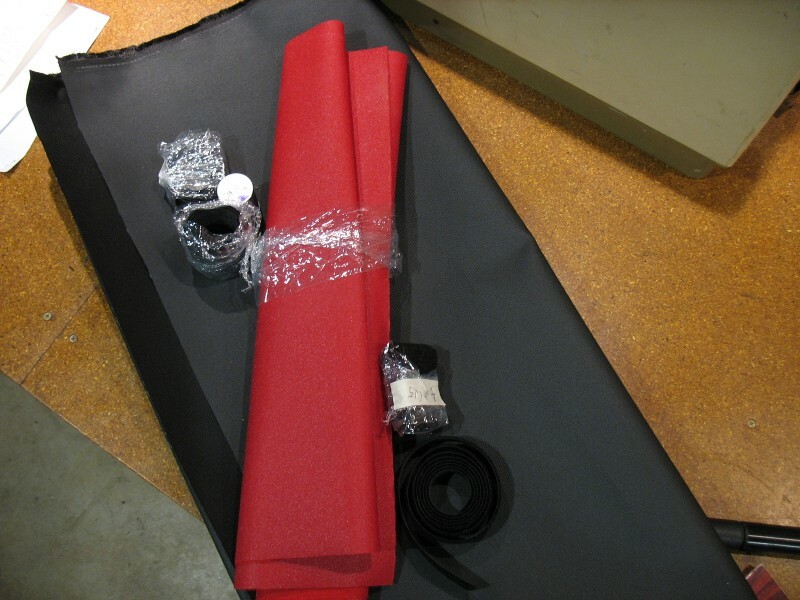 I used #500 or #600 cordura for the edges of the bag (the red parts) black parts were 1050 cordura. Since then I have lightened it up with other types of materials. Have you put any dividers into the bag? If so how do you sow them in. I can see how you make a basic bag (make inside out and invert) but how do you add dividers which would also help with keeping the bag from bulging? 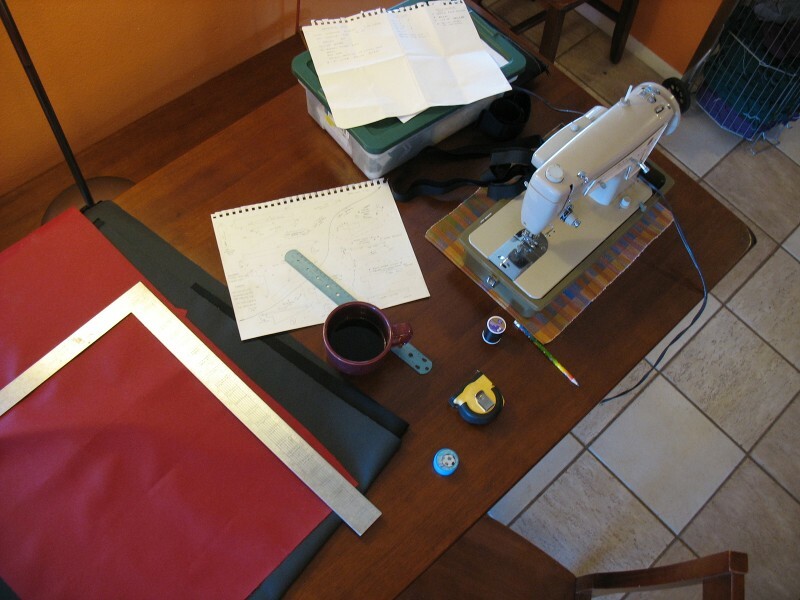 I originally designed the bag with removable dividers – using Velcro to hold them in place. I abandoned the idea because it did not seem that useful to me. I try to carry the heaviest stuff I have (beyond water) in the frame bag. I have straps for a pump sewn in, but beyond that, it stuffs nice and tight with a few 29er tubes, tools, water filter and a tarp, a flask, maps a long sleeve micro layer and some other stuff. I don’t know that compartments would help the task. Great looking work. Im confused though, wouldnt you prefer a bit more space and attach water bottles to the fork? 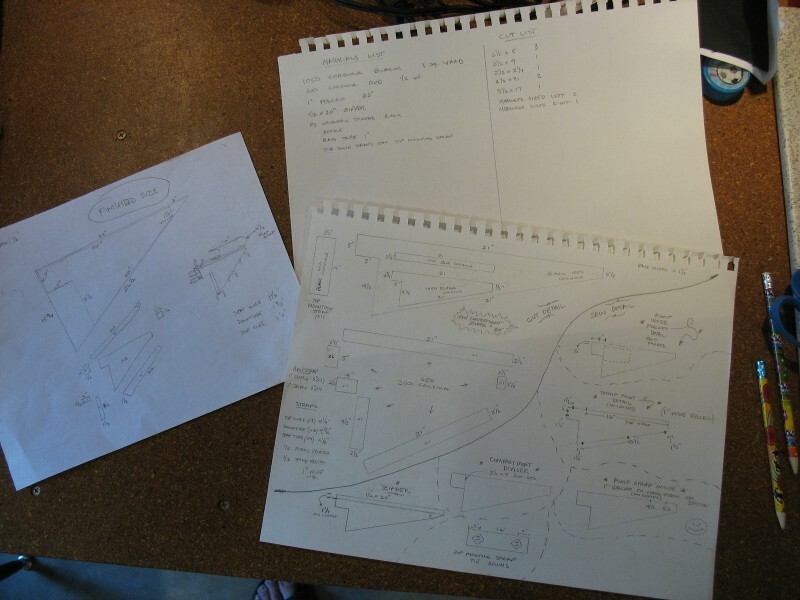 Very proffessional looking job, but a bit complicated. I made mine by sewing two halves of material together leaving the top open.I sewed a double ended separable zip across the top. This zipped the bag onto the frame and allowed access inside. I kept the bag stretched out by tying it to the stearinghead, seat tube and bottom bracket. I used kite material, which is light, ripstop and waterproof coated but not terbly durable.